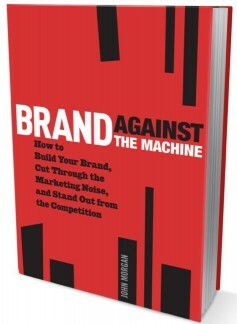 John Morgan’s book “Brand Against the Machine” is really a full length definition of branding itself. Sure, there are examples of small business branding mistakes and a whole lot of what you should be doing. But as a whole, it’s what the dictionary should reference when you look up “branding”. Blockbuster is an example of a company that didn’t see it coming. Coincidentally in Chapter 13, titled Extra Ordinary (not Bankruptcy Court), Morgan talks about the rise of Netflix and Redbox in the wake of Blockbuster’s meltdown. He makes the point that it wasn’t Blockbuster’s failures that made Netflix great. In fact, Netflix became great because they did something “extra ordinary”. They took something mundane like renting a video and added a spin no one had ever tried before. Redbox is now doing the same thing. Blockbuster, unfortunately, never was able to respond with an idea more powerful than Netflix’s. Some of Blockbuster’s problem was its inability to define itself in the marketplace. They were never the “low cost rental place” nor did they position themselves as the “best selection place”. And with their constantly changing late fee structure – they left customers thirsty for anything that could take its place. #11. Don’t pay attention. Because a well branded buggy company will still be able to compete with a poorly branded Daimler Chrysler. And people will always visit their customer service oriented, family-run cathode ray tube TV repair shop. So go ahead and keep on not paying attention, Blockbuster. Why should you listen to John Morgan when it comes to this topic when there’s a chance you’ve never even heard of the guy. Fortunately, that’s by design. The focus of his career has been to make sure you’ve heard of his over 300 clients (many of which you hear about every week). While a celebrities do knock on his door, it’s the other masters of branding that tout his name. Just look at the book jacket and you’ll see the likes of Chris Brogan, Mitch Joel, Scott Stratten, Carrie Wilkerson and MSNBC. These aren’t people with limited resources. They’re people and companies who’ve chosen above all others to utilize the services of John Morgan. It’s that confidence and experience that fuels Brand Against the Machine. You’ll know instantly that you’ve purchased the right book and are headed for good things.